Hello and welcome to the mother of all reading lists! 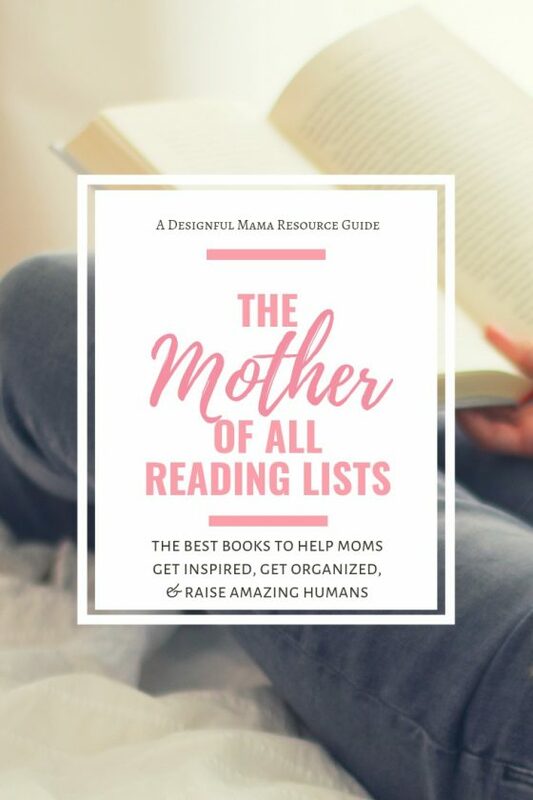 Today I’m sharing with you some of my favorite reading resources for moms of young children. Particularly for moms, time is a scarce resource. When you pick up a book, it’s great to know it’s one that will make a difference in your life. These books create a well-rounded library of must-haves for moms of young children. Note: the links below are affiliate links, which means if you click a link and make a purchase, I will receive a small percentage of the purchase amount for the referral. This does not affect the price you pay. You can read my full Affiliate Disclosure here. And whether you buy through my links or not, I’m still thrilled to recommend them to you wholeheartedly! Whether you’re looking for inspiration, education, or help in the trenches, these are the books to read. I have purchased, read and/or listened to every book on this list, as well as many others, and have listed only those that I believe you will find the most valuable! And now, I present to you: The Mother of all Reading Lists. Enjoy! Just when we think we’ve figured something out when it comes to our kids, they reach a new phase or stage and the rules feel like they change again. I know very few parents who haven’t asked the question from time to time about whether what their child is up to is “normal.” We moms worry about the development of our kids and are constantly measuring their abilities and behaviors against the yardstick of what their siblings and peers are doing. And when it comes to relating to our children, it helps to start with an understanding of what to expect physically, cognitively, behaviorally and emotionally as they grow and develop. These resources serve as a well-rounded reference set. If you’re looking for a solid reference book on what goes on in a child’s world, Touchpoints-Birth to Three provides solid information about what your child is doing developmentally from newborn, to the first few weeks, first several months and up to their 3rd birthday. The late Dr. T. Berry Brazelton has written a number of books on parenting, discipline and child development. As a pediatrician who wrote over 200 scholarly papers and 2 dozen books, he understands well the concerns parents have for their children, and how to address those concerns with sound advice. Touchpoints is written in three parts; the first is broken down chronologically according to the developmental milestones a child is working through in phases and stages. The second is an alphabetical index of common concerns parents have by topic, from colic to bed wetting and sleep issues. This updated version also addresses ADHD, developmentally appropriate discipline, and life circumstances that produce challenges to development. The third section addresses the child’s core people, which Brazelton calls the child’s “allies in development,” from parents to caregivers and teachers to medical professionals . This is one you will want to refer frequently in the early months and continue to read every few months throughout your child’s development as you respond to his or her changing needs. And as your child moves into the toddler years, check out Touchpoints 3 to 6 . Drs. Daniel J. Siegel and Tina Payne Bryson have teamed up to create The Whole-Brain Child: 12 Revolutionary Strategies to Nurture Your Child’s Developing Mind , a book that teaches parents about the brain development that is happening in their child, and how a solid understanding of this development gives us insight, sensitivity and age-appropriate ways to encourage and nurture that development. It includes common situations in a child’s day that may trigger big emotions, tantrums, behavioral challenges or power struggles, and gives parents easy-to-remember and easy-to-implement, simple dialog we can use to help our child through those moments, while nurturing our relationship with our child and encouraging brain growth. The book teaches us how to help our children build connections and balance between their left brain and right brain, their “upstairs brain” and “downstairs brain”, and how to help them build memories and narratives they can use to problem solve. And if we are being totally honest, it gives us strategies for doing the same for ourselves so we can be good role models of emotionally healthy adults! I loved this book enough to buy the audio version of the book as well, read by the authors. There is also a workbook available for those who want to put these concepts into practice with additional guidance. Note: if you love this book, you may also enjoy The Yes Brain, by the same authors, which teaches us how to raise children who can be resilient, compassionate, creative, and can make good decisions. It’s available in an audiobook format as well, read by the authors. Written by Alicia F. Lieberman, Ph.D., The Emotional Life of the Toddler offers parents a deeper understanding of what really makes their toddler tick. What is going on both developmentally and emotionally that makes a toddler a walking contradiction? Why does (s)he push us away when we give the embrace they crave? What can parents do to support the emotional changes and developmental leaps their child is making? Lieberman addresses these questions and more, including toddler fears and anxieties, temperament differences and how they affect the toddler’s world, living with a high-activity toddler, toilet training, screen time, sibling rivalry, and the role and impact of child care on the toddler. The book offers clear advice and insights on how to address the concerns of the toddler and how to foster a deeper connection with the child. Written by Dr. Charles E. Schaefer and Theresa Foy DiGeronimo, Ages and Stages: A Parent’s Guide to Normal Childhood Development walks parents through several facets of development from birth to 9 years of age: Emotional Health, Cognitive Development, Family and Peer Relationships, Personal Growth and Character Formation. They divide the child’s development into 4 chronological stages and give parents a clear idea of what to expect in each of these categories. In addition to the “what” and the “why,” the book gives parents the “how” – what to do and what to avoid as your child’s needs evolve. This is another solid reference book to keep on the shelf throughout their childhood. Written by Dr. Marc Weissbluth, Healthy Sleep Habits, Happy Child, 4th Edition: A Step-by-Step Program for a Good Night’s Sleep gives parents extensive, clear and compelling information about the developmental, emotional and behavioral costs of inadequate sleep in children. Dr. Weissbuth provides guidelines about how much sleep children should get both at night and in daytime naps. The book has chapters broken out by age with specific sleep needs. Weissbluth encourages parents to give their children the gift of sleep by teaching them to self-soothe so they aren’t dependent on their parents’ presence to fall asleep, and presents techniques for training children to sleep. There is also an audio version of the book, read by the author. Note: for foster parents and parents of children who have endured early trauma or separation from their family of origin, please talk with your child’s doctor and/or mental health professional about the best options for helping your child sleep. 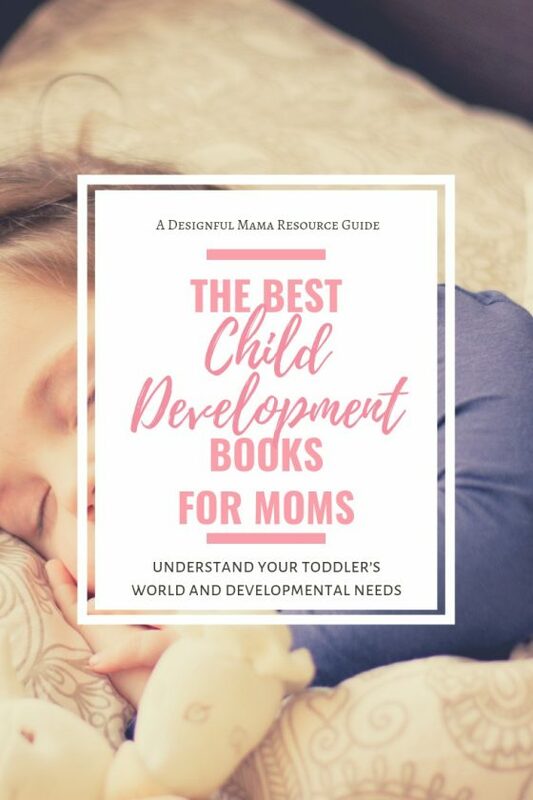 These are great resources for moms who are looking for some sound advice and direction for dealing with the challenges of the toddler years. What these resources have in common is that they are focused on the parent-child connection as the core of any good parenting, and provide insight and guidance that can make the difference between getting through your day and parenting with intention. In her book Peaceful Parent, Happy Kids: How to Stop Yelling and Start Connecting (The Peaceful Parent Series) , Dr. Laura Markham presents the 3 keys to parenting healthy, emotionally well-regulated children who want to behave and who can manage themselves well. In part one, she addresses self-regulation for parents and the importance of parenting peacefully. In part two she deals with the heart of parenting: connecting with your child and nurturing that connection. And in part three she teaches parents how to “emotion coach” their children to better equip them to become self-regulated and emotionally healthy. 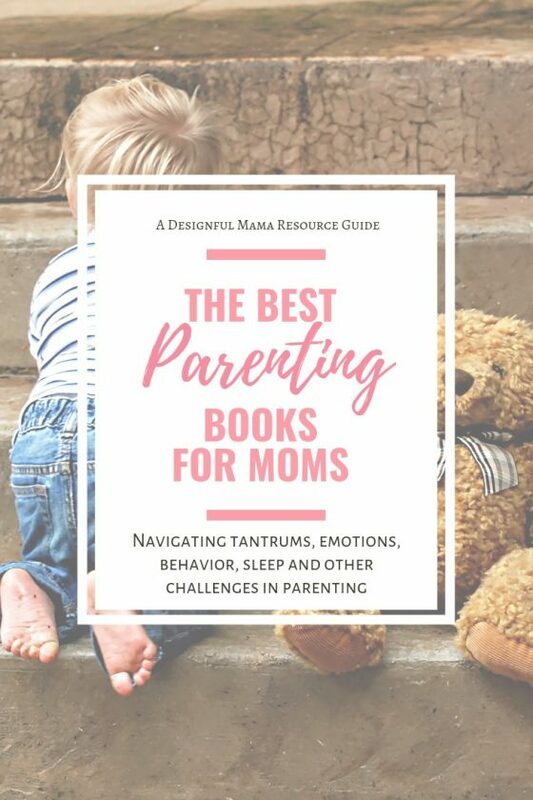 While she does include very helpful information for parents who struggle with anger, this book is a great resource for every mom who wants to teach her children how to have a healthy relationship with their emotions. The audio version of the book, narrated by Xe Sands, is pleasantly narrated and easy to follow. And for parents looking to do a more in-depth study, a workbook is also available. Written by Daniel J. Siegel, M.D., and Tina Payne Bryson, Ph.D., No-Drama Discipline: The Whole-Brain Way to Calm the Chaos and Nurture Your Child’s Developing Mind is centered on the concepts of connection and redirection. Practicing what the authors call relational discipline is about setting clear and firm boundaries and limits, while respecting and honoring the child and strengthening the parent-child bond. This book reframes the concept of discipline as one of teaching and shows parents how to check our own emotional responses and use opportunities for teaching in a way the child can internalize. The authors include illustrated examples of common mistakes parents make with verbal and nonverbal responses to our children and how we can improve our parenting so we model appropriately for our children. There is also an audio version on the book, narrated by the authors, that is an easy listen, as well as a workbook for parents who want to do a more in-depth study. In Time to Parent: Organizing Your Life to Bring Out the Best in Your Child and You , Julie Morgenstern brings the same logic and organization she is known for in her other books (such as Organizing From the Inside Out). Morgenstern identifies four core categories of activities we do when caring for children – which include everything from managing activities and providing for the child (things they cannot see, but that are necessary), to our connections and activities with the child, and discusses why being present is so critical to a healthy parent-child relationship. She also coaches parents in four core categories of taking care of ourselves so that we can be the best parents possible. I love the audio version of the book (read by the author), but found I liked having the printed version as well for reference. It is no surprise that How to Talk So Kids Will Listen & Listen So Kids Will Talk by Adele Faber and Elaine Mazlish has sold some 3 million copies – the advice they wrote nearly 40 years ago is as valid today as it was then! Not only do the authors coach parents on how to communicate with their children, but they also provide illustrations and examples of dialogues parents can rehearse and personalize, along with workbook-style assignments to help take the information from concept to practice. The book covers expressing and managing emotions, building cooperation, setting limits, discipline and conflict resolution. It’s one every parent should have on their shelf as a resource to keep up with their child’s changing needs. And for moms of toddlers through early elementary school-aged children, the authors’ daughters have written a follow up for young kids: How to Talk so Little Kids Will Listen: A Survival Guide to Life with Children Ages 2-7. It’s written with humor and the kind of understanding that only comes from other moms that have been where we are right now. If you are blessed with a child who is driven, determined, persistent and energetic, you may well be raising a future leader. But the very qualities we admire in spouses and leaders as adults can make for some serious battles of will in the parent-child relationship. And as nurturers and leaders of the humans entrusted to our care, we can fall into patterns of parenting that actually perpetuate cycles of frustration, power struggles and behavioral challenges. That is where Parenting the Strong-Willed Child: The Clinically Proven Five-Week Program for Parents of Two- to Six-Year-Olds, Third Edition comes in. I chose this book as a must-read not only for moms of strong willed children, but for any parent who is struggling with the same challenges every single day. Written by Drs. Rex Forehand and Nicholas Long, the book is based on sound clinical research and practice. It offers actionable steps to address strong willed behavior – by training parents (with actual, practical homework) to become more attuned to their children’s needs and to develop a deeper connection with their child. This builds the foundation to enact positive changes that last by teaching appropriate behavior in the context of a healthy parent-child relationship. There is also an audio version of the book, read by Barry Abrams, who narrates in a clear and easy to follow voice. We all want to live lives of meaning and purpose. And yet it seems some days in the motherhood it’s all we can do to get dressed and keep up with the chaos that is our every day. We aspire to big dreams inside and outside of our calling to raise amazing humans. If you’ve ever wondered whether you’re living your purpose, or if you’ve ever felt a pull to a big goal you dare not even speak out loud, these are just the right books to help you ask yourself the right questions and find the right answers so you can live with intention. 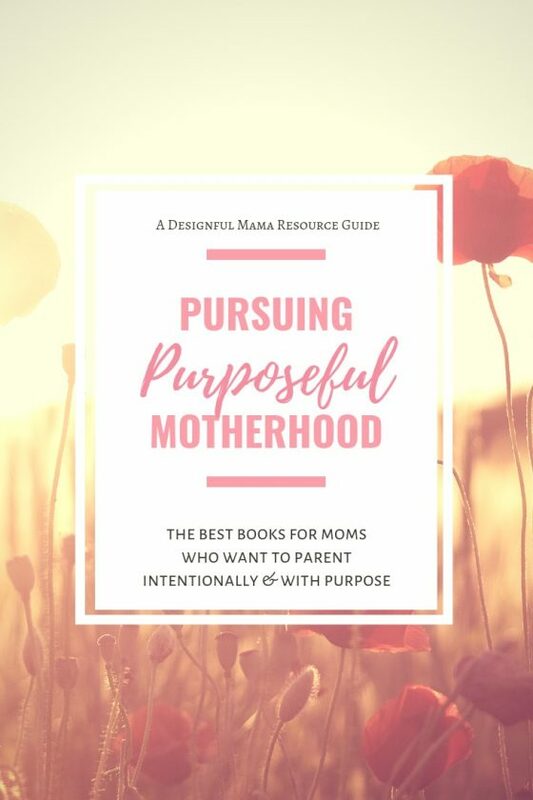 Every mom who has ever wondered if there is a purpose for our lives beyond the world of diaper changes and goldfish crumbs can benefit from this focused time of diving into God’s word and seeking His plan for our lives. The Purpose Driven Life: What on Earth Am I Here For? by Rick Warren provides a 40-day journey to discover our “why” in the context of God’s greater plan for each of us. In this 40-day study, Warren takes us from “who am I” to discovering our mission, planting roots in our community, and living out our purpose for God’s glory. There is an accompanying DVD and workbook set available, as well as a journal for those wishing to go a little bit deeper with this as a study. Motherhood is a continual juggling act. Priorities, activities and to-dos can often create a disconnect between us and those whose company we crave the most. Stafford’s book is written in easy to digest chapters that end with reflection questions that you can use to make a difference in your choices and focus today. Hands Free Mama is also available as an audiobook, read beautifully by Jaimee Draper. In Present Over Perfect: Leaving Behind Frantic for a Simpler, More Soulful Way of Living , Shauna Niequist takes moms through her own journey in the chase of perfection, the hunger for more, and her dedication to yes. She talks about how in our drive for these things, we push away the people who are closest to us, and teaches us how to refocus on what really matters. If you want to get the most out of this beautiful, poetic book, I’d invite you to gather with some other moms and do a book club using the accompanying workbook. There is a video series you can watch when you meet, and the group questions are already set up for discussion. There is also a solo work section for each chapter so you can dig deep into your own heart. 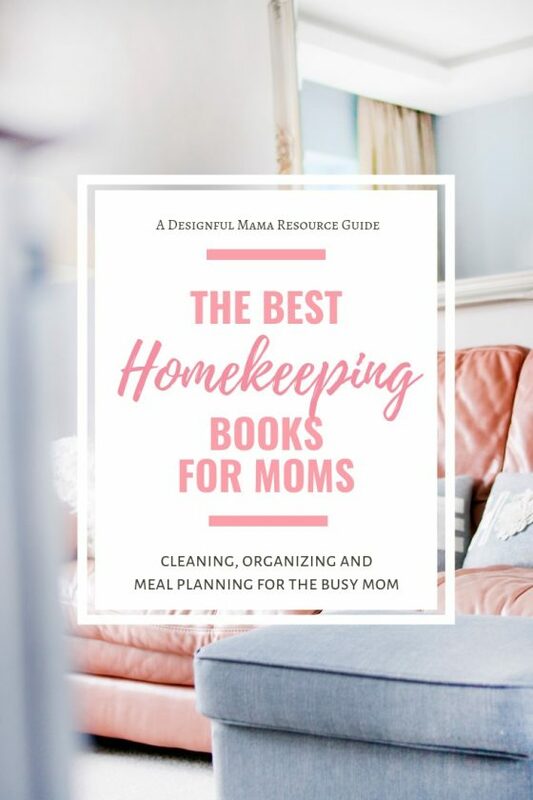 I recommend this to any mom who feels pulled in every direction and craves a simpler life and a deeper connection with the most important people in her life, but especially to mompreneuers who feel they are always trying to do more, be more and work harder, and who don’t know how to hop off of the hamster wheel. If you prefer to listen while you walk, I can also recommend the audio version of the book, read by the author. In her book The Best Yes: Making Wise Decisions in the Midst of Endless Demands , Lysa TerKeurst helps women identify the things that pull on our time that distract us from the highest priorities in our lives, and that often demand higher priority than we want to give them. When our priorities and commitments are out of balance, we become tired, resentful, overburdened, and begrudgingly do the things anyway. And we wish it could be different. TerKeurst shows us in her book how we can reclaim what is most important and only say yes to those things that matter most: choosing our “Best Yes” over all the demands for our time and attention. The Best Yes also has a corresponding DVD and study guide set available for personal or small group use, that guides us in the deep work of finding and living our Best Yes. Life change, wisdom, personal growth, strong relationships and sound faith don’t happen overnight. They take time and intention, and need to be nurtured and tended like a garden. In Cultivate: A Grace-Filled Guide to Growing an Intentional Life , Lara Casey shares her story of creating a garden with her daughter and relates the concept of tending and cultivating a garden to the process of creating an intentional and purposeful life. Casey provides thoughtful encouragement and insightful wisdom as she inspires women to nurture those things in our lives that we cherish so that we can watch them blossom in season and over time. This story makes for a great listen as well. The audio version of the book is read by the author. 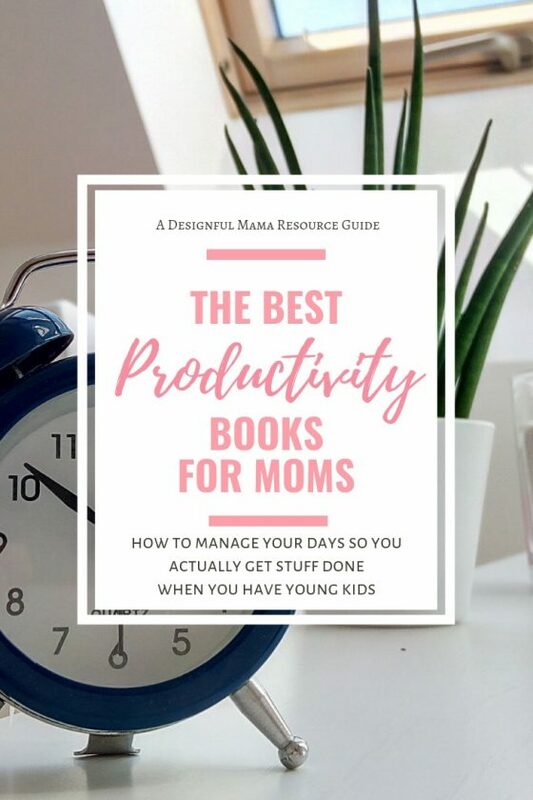 Whether you work outside the home, are a mompreneuer or are momming full time, these resources offer help with taming the to-do’s that threaten to take over our lives and our minds, and coach readers in effective ways to actually take tasks, goals and dreams from to-do to done. The productivity book Getting Things Done: The Art of Stress-Free Productivity by David Allen has earned its own following, and rightfully so. Allen is a business coach and management consultant who teaches readers how to free their minds from the overwhelm and mental clutter that happens when we have so much on our plate that we can hardly think straight. Sound like motherhood? Well, yeah. So it’s no surprise that this one made my list for moms who want to see some results for all the “doing” we do all day. Allen’s book helps readers set up the tools and systems to capture and organize the daily influx of paperwork, emails, messages, and thoughts and process them. He provides systems for getting projects done and for making sure nothing slips through the cracks. Most importantly, Allen shows us how following a system for capturing and processing all the things can help us to live and work in a state of high focus and productivity so we can be fully present in our day to day. In Time Management from the Inside Out, Second Edition: The Foolproof System for Taking Control of Your Schedule — and Your Life , Julie Morgenstern takes the same principles she uses in organizing physical spaces and applies them to the way we fill the hours in our days. Her book offers exercises to help us understand our “unique relationship with time” that can help us to be more effective in the ways we choose to use it. Morgenstern helps readers identify the things that stand in our way of organizing our days, from technical errors, fears and assumptions to external realities beyond our control. The book includes time mapping techniques and offers life hacks for getting out the door on time, to getting bills paid and even selecting the planner system that is best for us (and that we will actually use)! If you find yourself stuck in a cycle of overwhelm and the feeling that you are failing on a daily basis, Make it Happen: Surrender Your Fear. Take the Leap. Live On Purpose. is a great place to start. Lara Casey, creator of the popular planning and goal-getting tool, Powersheets, serves as mentor, coach and cheerleader for women to get unstuck and start living a life of intention and meaning. I listened to the audio version of the book, read by the author first, and found Lara’s voice to be one of an encouraging friend and coach. There are several reflection questions in the book that you will need to bookmark and come back to with a pen and paper, or you may prefer to do as I did and buy the printed copy to use as a workbook in conjunction with listening. What if a 3 minute morning routine was all you needed to start your day right? If you find yourself in an adrenaline-fueled response to the demands of the day from the moment your eyes open and your feet hit the floor, I’d encourage you to give this book a read (or a listen!). In Hello Mornings: How to Build a Grace-Filled, Life-Giving Morning Routine , blogger Kat Lee (HelloMornings.org) gives both grace and encouragement to moms who feel overwhelmed by all that the day holds, and breaks down 3 very simply, yet profoundly effective, steps to start your day with focus and intention. Hello Mornings is also available in audiobook format, read by the author, and listening to the book feels like listening to a friend over coffee telling her story, all while inspiring the listener to make 3 very easy changes that combine into a powerful morning routine. Moms have a lot of roles and responsibilities to juggle, and some days it feels like we have let every ball drop. There are to-do’s in each area of our lives, and demands on our time, energy and, it seems sometimes, our sanity. We can make the change from chaotic, disorganized, stressed out and frustrated to peaceful, controlled and well-ordered, if we know where to start. The book is broken into 7 sections and deals with stress, reality, priorities, expectations, time management and more. The sections are short enough to read daily, for a 7 day study, or to use as a weekly study in book-club format with other moms. In Simply Clean: The Proven Method for Keeping Your Home Organized, Clean, and Beautiful in Just 10 Minutes a Day , Becky Rapinchuk creates a clear system for getting the house clean and keeping it that way, even in the motherhood. She has easy-to-follow instructions for how to clean practically anything, and offers routines, checklists and challenges for maintaining a clean home. And Rapinchuk shows how to keep everything clean with a 10 minute daily routine. The best part is, she also provides a 7 day Kick Start to give you a plan of action when you have no idea where to begin. There is also an audio version of the book, read by Madeleine Maby. Every home needs a solid reference book that includes everything from setting up a kitchen with the necessary tools, to proper care of textiles, to cleaning just about everything. Cheryl Mendelson’s book Home Comforts: The Art and Science of Keeping House is exactly that book. Mendelson has done the careful research and compiled a hefty book that can educate new homemakers as they set up home and serve as a go-to reference for many years for how to clean and maintain pretty much everything. There is an extensive section on laundering and fabric care, including how to remove stains, and even laundry mishaps. There are even illustrated instructions on how to fold fitted sheets. The book also covers topics such as setting up a home office, living with pets, home air quality, sleep quality and bedding, home safety, fire, warranties and even hiring domestic help. For most moms, it seems we spend our days doing a lot of things with no actual boxes checked. Messes get made and cleaned and made and cleaned. Taking action on bigger cleaning projects or even where to put things besides the kitchen counter can get put off until we have time to think about it, and before we know it, the house has reached critical mess. Sound familiar? If procrastination from perfectionism or just plan exhaustion has led to a mountain of clutter, or if you want an actionable plan to getting the house clean and keeping it that way, then I recommend Dana K. White’s How to Manage Your Home Without Losing Your Mind: Dealing with Your House’s Dirty Little Secrets . Each chapter comes with a section called, “Just tell me what to do.” Want to enjoy this book even more? Listen to the audio version of the book, read by the author. And if you love it, White has a follow up book called Decluttering at the Speed of Life, available as a printed book as well as in audio format. Because chicken strips and buttered noodles aren’t a long term meal planning strategy (wait, what?)…. If you struggle daily with getting dinner on the table that all the people in your home will eat, or with buying a bunch of food only to have it go bad before you figure out how to turn it into dinners, then you’ll love Dinner: The Playbook: A 30-Day Plan for Mastering the Art of the Family Meal: A Cookbook . Author Jenny Rosenstrach takes moms though the process of creating a 30 day plan for cooking actual meals. And she teaches readers how to get the meal plan organized so dinners actually happen. The icing on the cake? All the amazing recipes that kids will actually eat! Getting out the door with kids is hard enough without the added chaos of not being able to find what you need before you go. Julie Morgenstern’s book Organizing from the Inside Out, Second Edition: The Foolproof System For Organizing Your Home, Your Office and Your Life will teach you how to set up systems and organize your space to eliminate those daily frustrations. Morgenstern starts by identifying technical errors, external realities and internal obstacles that have led to disorganization to help readers dig in to find a system that will work. She then us to create zones and then goes into detail by room, from kitchens, baths and home offices to kids’ rooms and closets, including an action plan to actually get the work of organizing done. The best days tend to happen when we have a chance to connect with God. To take in His word, to reflect on His grace and goodness, and to center our thinking on His truth. For moms of small kids, those moments of connection are often hard to come by. Grace Fox wrote 10-Minute Time Outs for Moms with that in mind. Each day’s devotional takes just a few minutes and begins with an “Upward Gaze” (reflective prayer), followed by a short illustrative story, and ends with a 3 part section that includes an “Inward Glimpse” (focusing prayer and questions for reflection or journaling), “Outward Glance” (closing prayer), and “One More Peek” (a bible verse to carry with us as we continue our day). In Long Days of Small Things: Motherhood as a Spiritual Discipline , Catherine McNiel invites moms to examine our role from the perspective of spiritual development. McNiel relates to the reader as a real mom facing the same issues any mom might wrestle with: feeling invisible, exhausted, depleted, desperate for a deeper connection with God and without the time to devote to spiritual disciplines. In each chapter, McNiel focuses on a facet of our faith walk that can be deepened through our experiences as moms, not in spite of them. She ends each chapter with a practical section that invites moms to take in the everyday moments and see them from a higher perspective. The book is also available as an audiobook, narrated by Andrea Emmes. If you’re at all familiar with Jen Hatmaker, you know that she writes with equal parts wisdom, heart and humor. Like, snort-laugh out loud funny humor. Out of the Spin Cycle: Devotions to Lighten Your Mother Load is both thoughtfully written and thought-provoking, and covers topics like comparison, worry and even Christianese in relatable vignettes that even the busiest mom can squeeze into the day. Out of the Spin cycle is also available as an audiobook, read by Sarah Zimmerman. Written by Melissa B. Kruger, Walking with God in the Season of Motherhood: An Eleven-Week Devotional Bible Study is a robust and in-depth study that offers daily reading and thought-provoking questions that bring mothers into a deeper and closer connectedness with God. This study works equally well for individual or group study, and includes a guide in the back of the book for facilitating group study, including icebreakers and group discussion questions. Each week is broken into 5 days, with weekly spiritual themes such as purpose, wisdom, joy, peace, patience, gentleness and more, which are paired with challenges and themes we face as moms, like understanding our purpose, training and discipling the hearts of our children, overcoming anxieties and worries, and ordering our homes. This book will draw you into the practice of daily study and prayer, and by doing so, will have a profound affect on your day to day interactions with your children. Ashlee Gadd, founder of the site Coffee + Crumbs, has compiled The Magic of Motherhood: The Good Stuff, the Hard Stuff, and Everything In Between , a collection of essays and stories written from the hearts of mothers, to reach out to, nurture and inspire a mom’s soul. Wherever you are in your motherhood journey, these stories and essays resonate with moms and remind us that we are never alone. In addition to being beautifully written, The Magic of Motherhood is visually beautiful and makes a great gift – or a lovely treat for yourself. 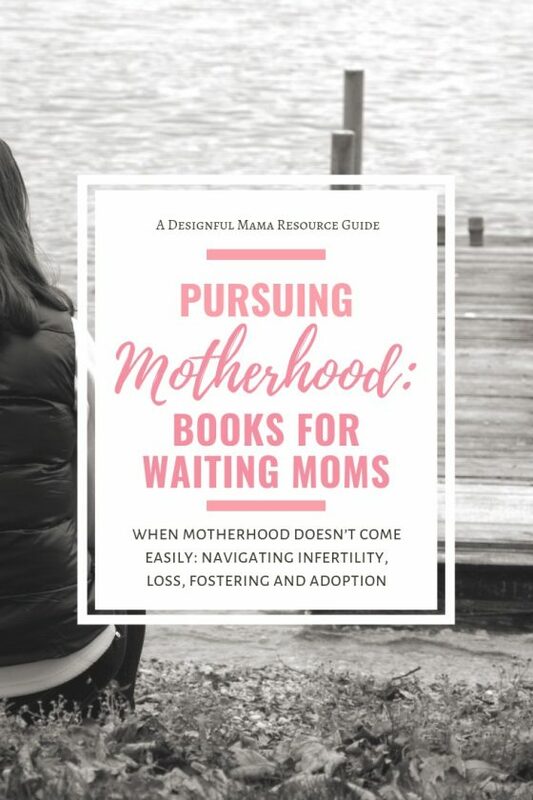 When motherhood doesn’t come easily, and especially when it is a deep longing, the months and years of waiting can be painful, lonely and even heartbreaking. And yet it’s a private pain in many ways, because it’s an uncomfortable subject and few family or friends know how to respond. In her book Baby Hunger , Beth Forbus is the friend who knows what to say. She has endured the heartache of waiting, of wondering “why me?”, of discouragement and fear and putting on a brave face. Having experienced this firsthand, she delivers a message of encouragement and hope that we are not alone in our tear-stained journey, nor are our prayers unheard. 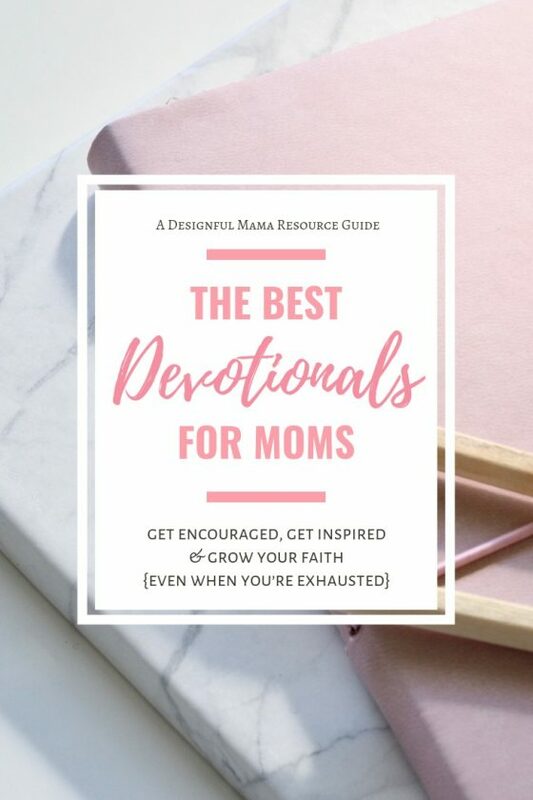 Forbus uses biblical examples of mothers who have walked the same road and how, like them, we can draw closer to God during our struggle and come away with peace and joy, and a powerful story that can be used to minister to other moms to be in their journeys. In her autobiographical book, Instant Mom , actress, producer, director and writer Nia Vardalos shares her journey to motherhood, including infertility and loss, and the ultimate decision she and her husband made to adopt via the foster system. Her refreshingly honest story illustrates the private pain of infertility and loss, and gives readers a glimpse of the emotional roller coaster of both parenting a child who has suffered the trauma of separation from her family of origin, as well as the anxieties and worries of parenting when permanency is not a guarantee. Her story is one of hope and healing for both the parents and the child, and is what gave me the courage to consider becoming a foster parent. The book is also on Audible, read by the author. Even if you aren’t an avid audiobook listener, to hear Vardalos tell her story in her own words feels less like a narrated story and more like a coffee date with a friend. Adopting a child internationally or through the foster care system can often mean embracing the unknown. We do not always know the stories of our children’s lives before they come into our care. But as their adoptive parents, we are the fortress that will give them safety, love, security, and help them heal and thrive. The Connected Child: Bring hope and healing to your adoptive family by Karyn Purvis, Ph.D., David R. Cross, Ph.D., and Wendy Lyons Sunshine gives practical advice and insightful teaching for parents as they navigate the process of connecting with, and raising a child through adoption. This is one book you’ll want to have close at hand post-placement, and is a great resource for foster parents too. The importance of building healthy attachment in children cannot be emphasized enough. Healthy attachment in infancy and early childhood is the building block for all types of human interaction and relationships throughout the child’s life. Particularly when a child suffers the trauma of separation from his or her family of origin (or has suffered from the losses of multiple placements, as often can happen in foster care), it is critical for foster and adoptive parents to build healthy attachment with the children in their care. Deborah Gray’s Attaching in Adoption: Practical Tools for Today’s Parents is a resource all parents considering adoption should read before a child is placed in their care. She provides a tremendous amount of insight and coaching to help parents understand how best to care for, nurture and promote healthy and secure attachment in children both pre- and post-adoption. For anyone considering becoming a foster parent, I wholeheartedly recommend you read this book. So many parents go through the trainings and background process only to find that they didn’t feel well prepared for what it’s really like. Being a foster parent means managing big fears and emotions, advocating for the child, and serving as a resource for the child’s family all while parenting under extraordinary circumstances. It is challenging and, at times, isolating. In Confessions of an Adoptive Parent: Hope and Help from the Trenches of Foster Care and Adoption , Mike Berry brings both truth and hope to the parents whose hearts have been opened to fostering and/or adoption. Note: If you are considering fostering, or adoption of a waiting child in foster care, you may also be interested in Chasing Kites: One Mother’s Unexpected Journey Through Infertility, Adoption, and Foster Care, written by Rachel McCracken, and/or Welcome to the Roller Coaster: Real Life Stories of the Ups and Downs of Foster Care, a compilation of stories from real foster moms, written under the pen name D.D. Foster. Reading firsthand stories of what it truly means to be a foster parent can be helpful as you decide whether fostering is the right decision for you, your spouse and your family. Bookmarking this so hard! I absolutely love the ones of these I have read, so I can’t wait to read the ones I haven’t seen yet!